Another antioxidant rich food – Pomegranate! It’s loaded with vitamins and potassium. Researches show this power fruit buffers the effects of free radical damage, increase oxygen levels to your heart and reduce the redness of arthritis. It also reduces risk of cancers, especially prostate and breast cancer. These juicy little guys are a great snack as it is – so yummy popping in your mouth. You can also make juice. Pomegranates are one of the few fruits where juice is as beneficial as the fruit or seeds. I recommend using on salads like me, which not only gives a lovely presentation but also provides a beautiful sweet and acidic flavour. I warn you, though, when you cut open pomegranates and take all these seeds out it will stain your fingers, clothes and kitchen bench. I was so excited about cutting and squeezing the fruit, and next thing I realised was it’s a little late to wear my apron. Oh well.. it’s fun cleaning all up after cooking too, isn’t it? 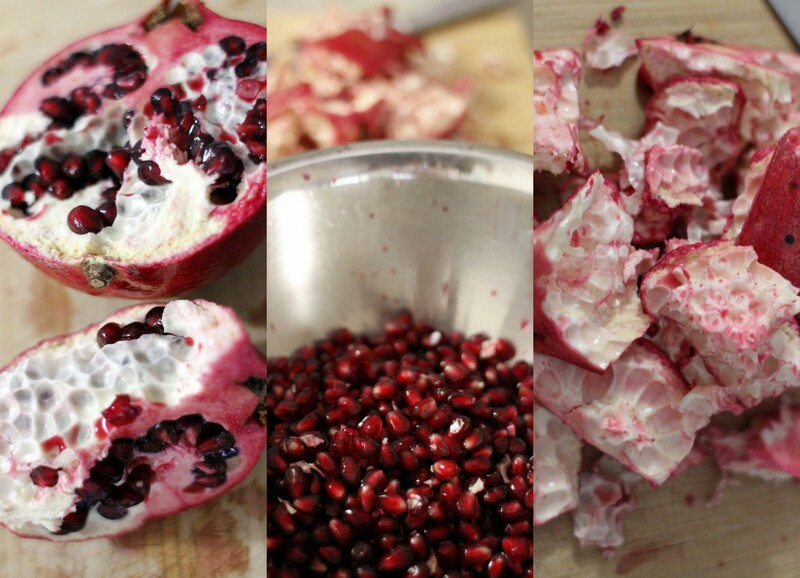 >.< To prevent all this mess, you can soak pomegranates in the bowl of water and work in the bowl, removing seeds from the flesh. All seeds will sink to the bottom of the bowl, so you need to drain well afterwards. I used butternut pumpkin, quinoa, shredded green and purple cabbage, red onions and green salad today. It looks so vibrant and colourful! 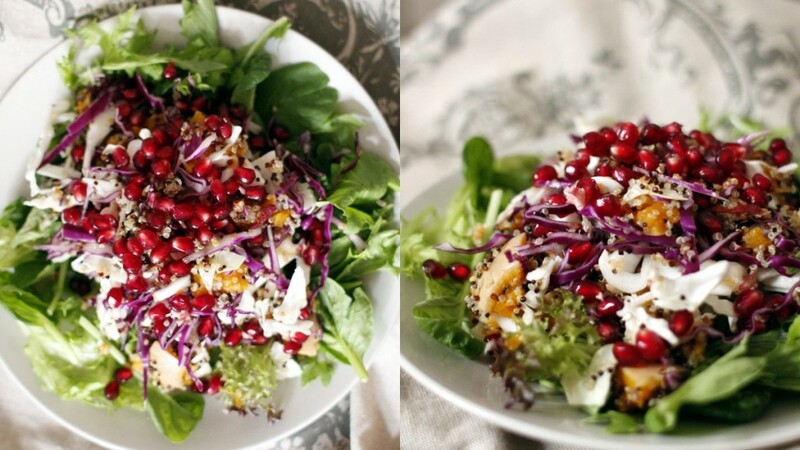 Examples of other salads that go well with pomegranates? Think about 3 things – colours, flavour and texture.